Firewalls, SSL and hardened networks are futile against web application hacking! Hackers are concentrating on web-based applications (shopping carts, forms, login pages, etc) – accessible 24/7 – and directly connected to your database back-ends with valuable data. Web applications are tailor-made, less tested than off-the-shelf software and likely to have undiscovered vulnerabilities that can be a recipe for disaster. Don’t overlook Website security at your organization! Acunetix tests for SQL Injection, XSS, XXE, SSRF, Host Header Injection and over 4500 other web vulnerabilities. It has the most advanced scanning techniques generating the least false positives possible. 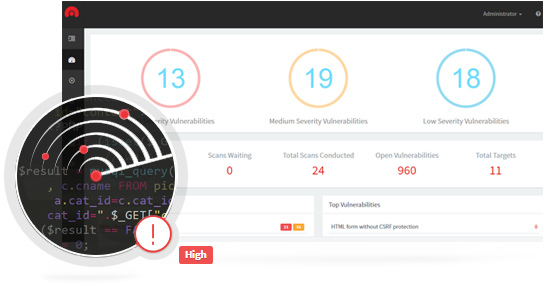 Simplifies the web application security process through its inbuilt vulnerability management features that help you prioritize and manage vulnerability resolution.